The TKSA 31 is the most affordable solution for easy laser shaft alignment. The ergonomic display unit with tough screen makes the instrument very easy to use and the built-in machine library helps storing alignment reports for multiple machines. Large sized laser detectors in the measuring heads reduce the need for pre-alignments and the embedded soft foot tool helps establish the foundation for a successful alignment. Additional functions such as live view and automatic measurement support fast and effective alignment tasks and make the TKSA 31 an innovative laser shaft alignment tool that is affordable for almost every budget. Easy measurements can be performed by using the well-known three position measurement (9-12-3 o’clock) with additional positioning flexibility of 40° around each measurement position. High affordability is achieved by focusing on the standard shaft alignment process and essential functions to allow quick and effective shaft alignments. 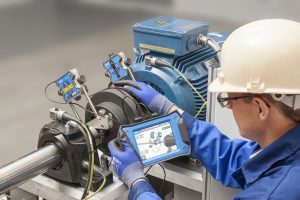 “Automatic measurement” enables hands-free measurements by detecting the position of the heads and only taking a measurement when the heads are in the right positions. Automatic reports are generated after each alignment and can be customized with notes about the application. All reports can be exported as pdf files. The machine library gives an overview of all machines and alignment reports. It simplifies the machine identification and improves the alignment workflow.